For those of you who know me personally — or at least the general details — then you’ll also know well that I have a “past” with Jeremy Enigk, lead singer of Sunny Day Real Estate. We were friends “back in the day”, you might say, though I haven’t seen or spoken to Jeremy in years. Bummer. It may come as a surprise, though, that I wasn’t much of a Sunny Day fan. Perhaps a twinge of jealousy was the reason, but I listen back to their earliest albums even now and I don’t find much that excites me. 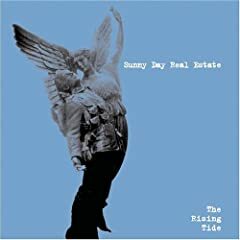 It wasn’t until after their (2nd) break-up that I stumbled upon “The Rising Tide”, and thus finally discovered the magic of Sunny Day Real Estate. I find an interesting divide between many Sunny Day fans. Many of these fans prefer the early albums *only* and dismiss the later albums — “The Rising Tide” and “How It Feels To Be Something On” — wholesale. As perhaps the “inventors of emo”, some fans consider their later works to be “selling out”, “not Sunny Day”, and so forth. I’ve heard the arguments. Other fans, like myself, prefer their later albums. Without a doubt, they are more commercial, more produced, and more “musical”, in my opinion. Of course, some fans like all Sunny Day material, whether new or old. Fine. For my musical tastes, though, I find that the later albums suit me. “The Rising Tide” is really a fabulous collection of songs. The album, while more “produced” than earlier efforts, still has a lo-fi, indie vibe to it, and I find a nice continuity between the tracks. They “fit together”, if you will, and it makes for a nice full-album listening experience. Some personal favorite tracks are ‘Snibe’, ‘Fool In The Photograph’, and the beautiful ‘Faces In Disguise’. I’m jealous again. Any fans of Jeremy’s solo work or The Fire Theft should really check out this album, but you already knew that. I can no longer call myself a “hobbiest guitar player”. I help lead worship at my church — which I enjoy very much — and in that role I have to take some things more seriously than I did before. My guitar has to be in tune. I need to have a decent pickup system installed. I have to be able to play standing up! (By the way, that was a bigger issue than I thought it would be). I also need a decent guitar strap. Don’t mock me on this. Between rehearsal and the worship “set”, if you will, you end up with a guitar strapped around your neck for a considerable amount of time. The guitar strap is important. My previous strap has given up the ghost, so to speak, and easily pops off of the straps nuts. Not cool, and not fun. I set out to find another strap that is both stylish and comfortable. My first trip was to Guitar Center in hopes of finding a good, reasonably-priced replacement. I figured that leather would be a good long-term solution, but I was unpleasantly met with $70+ guitar straps. Wha? I don’t think so. Too rich for my blood. Shortly thereafter, I found that Levy’s Leathers makes some nice guitar straps that can be found for a reasonable price. I found a 2.5″ black embroidered strap that cost me less than $40 shipped. Nice! Well…until it arrived and I found that it was too short for me. 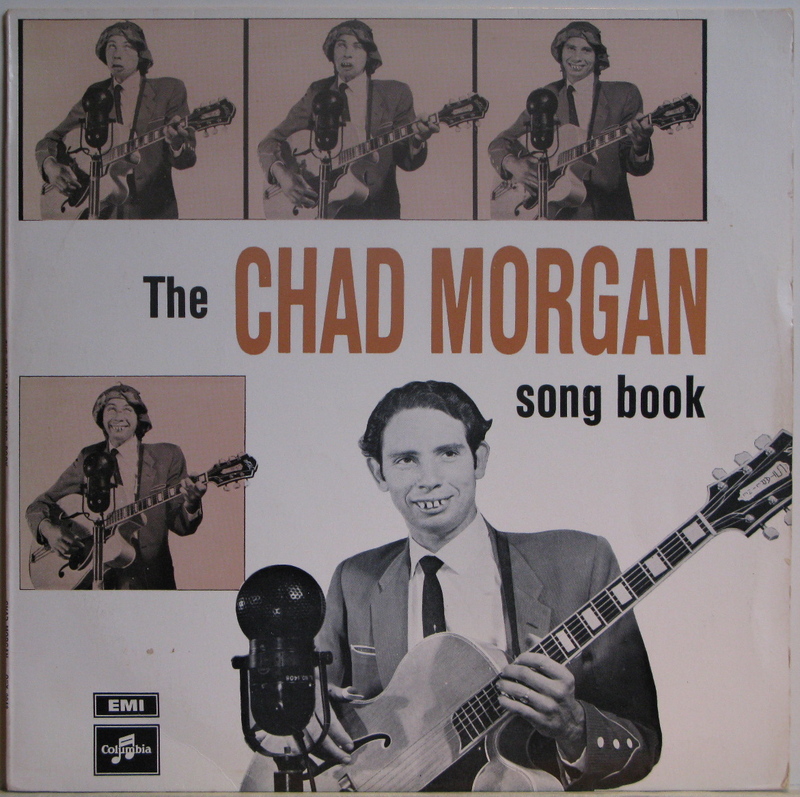 You see, I’m 6’4″ tall, and I tend to play with my guitar hung a bit lower. Not “punk rock”, mind you, but lower. Most leather straps tend to max out at around 53″ long, which was about 4″ shorter than what I was set at previously. No matter how I sliced it, it didn’t work for me. After some emails back and forth with the fine Levy’s Leathers folks, I find out that they make “XL” versions of almost all of their straps, which lengthens the strap by 12″ or so. Wish I’d known that earlier. I also wish I’d had a better up-close shot of the strap that I was ordering — a bane of “online purchases”, I suppose — because the suede finish was not entirely to my liking. I decided to return that strap and keep looking. Upon further reflection, I decided that I didn’t have to have a leather strap — it was enough to have leather at the ends for long term use. In fact, nylon and/or cotton straps can be quite comfortable, practical and affordable. 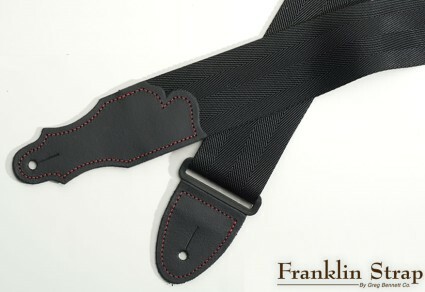 Somehow or another, I ended up stumbling upon a company called Franklin Strap. I liked the looked of their stuff, and I was immediately taken with their ‘Seatbelt Series‘ strap. Very cool! Sadly, I couldn’t find them online anywhere. Grasping at straws, I emailed the Franklin Strap company themselves to inquire as to where I might purchase one of these fine straps. I had no idea about pricing, availability and so forth. Well… a few hours later I get an email back from the company owner himself — Greg Bennett of Greg Bennett Guitars! He let me know that a shop called Artisan Guitars carried these and could help me order one. Good deal. Here’s the great part: I call Artisan Guitars — friendly folks, by the way — and tell them my story. They find the strap I’m talking about and get me going on ordering one. I still had no idea on pricing, so when the sales person mentions that the strap is $6 + shipping, well… I’m pretty blown away! Needless to say, I ordered two of them. So… here’s hoping that this strap is as awesome as I hope it’ll be. If not, well… atleast I got a cool story out of the whole process. For the unlearned among us, this is the band that Bjork was in before Bjork was a solo act. They released several albums through the late 80s and early 90s, though to limited commercial success in the United States. My wife and I both purchased this album years ago (on cassette tape, no less) and loved it. We’ve never owned it on CD, though, and it quickly became out of sight, out of mind. Oh, how the memories come back! It’s amazing how you can remember the subtle nuances of an album even after so many years. Needless to say, this is a great album and we’re both happy to have it back. I tell you one thing that has really surprised me in listening to this album again is the “timeless” quality of the music. “Life’s Too Good” is celebrating its 20 year anniversary this year, but the music honestly sounds every bit as current and relevant today as it did 20 years ago. It’s not 80s synth-cheeze. Seriously. Good stuff, and worth checking out if you’ve never heard this album. Coming soon…to a home near….us! I’d like to introduce Heather, our soon-to-be family dog. Heather comes to us via Summit Assistance Dogs, a local non-profit organization that trains dogs for assisting folks with special needs. I don’t have “special needs”, per se, but our five-year-old son, Brighton, does. You see, Brighton has cerebral palsy. Don’t know what that is? You’re in good company. I bet you’ve heard of it, though. Most folks have. A simple description would be this: cerebral palsy (C.P.) is brain damage that occurs before, during, or after birth. Pretty generic, I know, but the point is that C.P. isn’t a disease that you contract, or some sort of genetic disorder. It happens, and it cannot be “discovered” before birth, as many other conditions can. C.P. also is very far from being consistent. Some folks are severely crippled with C.P., while others are able to function almost perfectly normally, as we might typically define it. All that said, my son has special needs. He uses a wheel chair, he has hearing aids in both ears, he has limited use of his right hand, and he is unable to walk. Who knows if any of those conditions will change over time. Those things being as they are, we decided some time ago to look into assistance dogs — both for his help, and for our sanity. 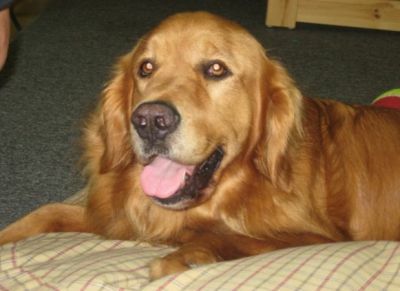 Anyhow, Summit Assistance Dogs has been awesome to work with! They train only a few dogs each year, and we’ll feel fortunate (and blessed!) to be a recipient. Heather will not be an “assistance dog” in the truest sense, because the assistance that our son can receive as a five-year-old is somewhat limited. She will be a great companion to him (and all of us), though, and we’re looking forward to that. We’re also anxiously awaiting to see if she might help him sleep better through the night, in picking up things that he drops (all the time! ), helping him move properly in his wheelchair, and just “being a friend”. I’m sure that her helpfulness will only increase as he gets older. Thanks for reading through this more-personal-than-usual posting. Have a great day! 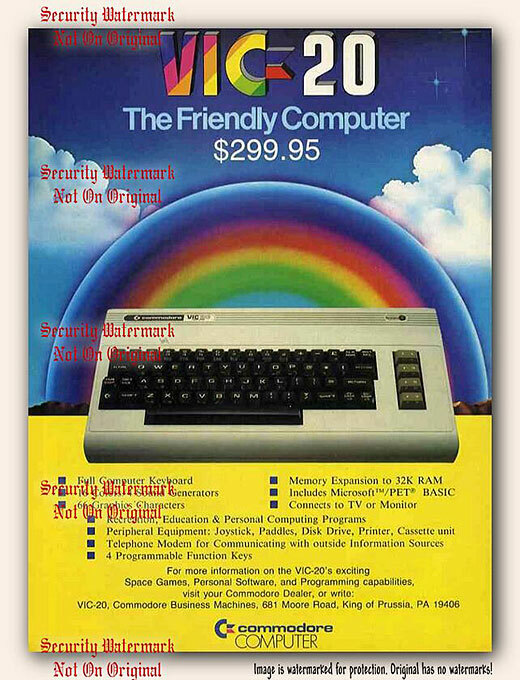 ….RETRO COMPUTING ADS! Check ’em out. Awesome stuff, really, and it brings me back to the “good ol’ days” when computing was much simpler in some ways, and (of course) a whole lot more difficult in other ways! Back in the early 80s, my family owned a MicroAge franchise computer store in Anchorage, Alaska. My Dad sold cutting-edge computers at the time. The IBM PC, the PC Jr, the Commodore 64, and, of course, the VIC-20, which is picture above. Harddrives? Bah. Dual low-density floppy drives was all you *really* needed. Honestly! Color monitor? Sure… as long as you only need 1 color: green or orange (amber). Hmmm…what else can I remember? Playing Moon Dust on our Commodore 64. I never really did understand that game, but it had a schwanky cartridge! Entering code by hand from Byte magazine for hours (and hours) with my brother so that we could play awesome games like Graveyard Charlie. The goal? Don’t run into a gravestone before you exit the cemetery. The trick? You can’t see *anything* except when the lightning strikes. Scary! Writing a *secret* phone book with my good friend Aaron (Sprinkle) where we would enter in girls from school and give them a “rating” of how cute we thought they were! I know, I know — pretty tasteless. We were in junior high, for crying out loud! The phone book was password protected, I’ll have you know! The early versions of Castle Wolfenstein! No 3D stuff here, kids!! Hmmm…the box artwork was always a LOT cooler than the actual game. Hmph. Writing a text-based adventure game with my good friend Bob (Luton). It was called “Nightmare at McMurray Junior High” and we never got very far. It could’ve sold millions of copies, though! Putting the phone onto the modem cradle — a la WarGames!